Sweet, savory, creamy and tart all at the same time. This soup is an exciting treat for your tastebuds! Pretty as a picture - or two. 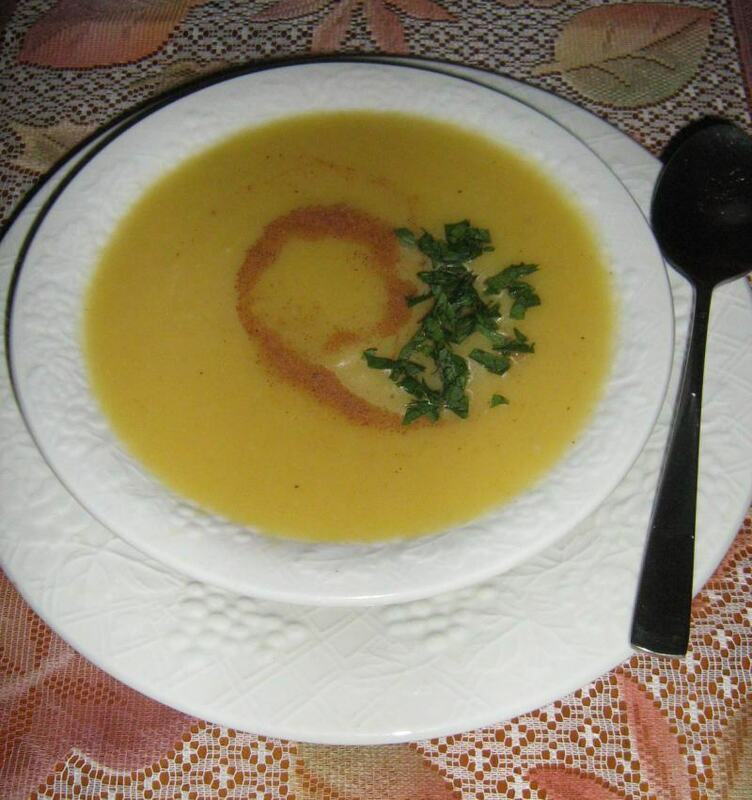 Apple and acorn squash soup. 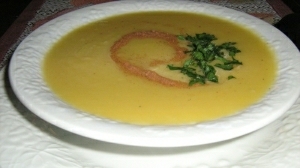 Apple and acorn squash soup is one of our favorites! Especially when things start to cool down a bit. As the Autumn weather begins to bring cool mornings and chilly evenings, there is nothing better than homemade soup to take the chill off! This delicious apple and acorn squash soup blends the sweet and savory flavor of acorn squash with the creamy texture of potato and just a hint of tart apple. It will warm you inside...we'll leave the outside up to whoever you share it with! Preheat oven to 375 degrees. Cut acorn squash in half length-wise, remove seeds and stringy pulp. Set on a rimmed baking sheet with a little water. Bake until tender when pierced, about 45 to 60 minutes (depending on size). Remove squash from oven and allow to cool. While the squash is cooling, heat the canola oil in a large pot over medium- high heat. Add the onion and leek and sauté for about 4 minutes, until the onion is translucent. Add the apple and cook over medium heat for 1 minute. Spoon out the squash and combine with the apple mixture. Reduce heat to medium-low, cover and cook for 5 minutes, stirring often. Add the broth and diced potato to the pot, cover and bring to a boil over high heat then reduce the heat to low and simmer for about 30 minutes. Remove the pot from the heat and set the soup aside to cool slightly. Use a blender or food processor to puree the soup in batches until smooth. Return soup to pot and heat just before serving. Season to taste with salt and pepper. Garnish each serving with a pinch of nutmeg and a sprinkle of mint and serve. 20g carbohydrate, 3g protein, 3g dietary fiber. Note: This soup is excellent made the day before you want to use it and refrigerated until then. This allows the flavors to really meld throughout the soup.